Calling from C into Ocaml. I've got a project where it would be nice to be able to call Ocaml code from a C program. Although interfacing Ocaml and C is covered in the official manual and the O'Reilly Ocaml book, neither of these sources have a complete example. The first function has a single string parameter and returns nothing, while the second takes two parameters, a string and an array of strings and returns a string. The main function is mostly self explanatory; the only thing to note is that if we want to call any Ocaml code from C, we must call caml_startup first. Looking at the functions that call into Ocaml, note that these functions begin with a call to CAMLparam0 and ends with a call to CAMLreturn0. These are both macros, the first of which sets up the Ocaml specific stack requirements and the second of which cleans up after the first. The '0' at the end of their names indicates that there are zero Ocaml managed data objects passed into and returned from the C function respectively. For values to be passed to Ocaml, we use local Ocaml managed variables set up with CAMLlocal1 if we only have one, or CAMLlocal3 if we have 3. Data can be copied into these local Ocaml variables using the caml_copy_* and caml_alloc_* families of functions. The Ocaml functions we want to call can be looked up by name using caml_named_value and the function actually called using caml_callback if we only have one parameter to pass or caml_callback2 for two parameters. For the call to ocaml_string_join which returns a string, we can extract the return value from the Ocaml wrapper using String_val. There are also other functions to retrieve other data types, the only real caveat being that if the type isn't atomic (eg int or double) and you want to return it from the C function it will be necessary allocate memory for it and copy it because the memory area returned from Ocaml will be invalid after the call to CAMLreturn0. The first line compiles to Ocaml file into an Ocaml object (*.cmx) using the native code compiler, the second takes the Ocaml object and all the other Ocaml objects needed and generates a object file (camlcode.o) that can be linked to C code. The last two lines compile the C code into an object file and then links all the C objects and required libraries into an executable. At this point its probably a good idea to run the program under valgrind and vary the first parameter to prove to oneself that un-freed memory when the program terminates is a constant (due to the Ocaml runtime) and does not vary in proportion to the number of times the Ocaml code is called (which would indicate a memory leak in the interface code). Ocaml : Null Cursor in lablgtk. Just Drawing Stuff on the Screen. Richard Jones laments that drawing stuff on the screen is harder than it should be. I haven't seen his code, but it looks like he might be trying to do it with Ocaml and GTK which probably is more difficult than it should be. GTK isn't really meant for that sort of stuff. I messed about with Ocaml and Cairo about a year ago and came up with this little demo. **    This uses a rough numerical approximation to integration. **    results should be reasonable. fun i x -> x *. So while I agree that the 140 of lines of code here is about 30 times as much as Richard's code from his ZX80 days, I also think the results are at least 30 times as good. At the June meeting of FP-Syd, Tim Docker gave a presentation about his Tuple Space Server written in Haskell. This presentation rather intrigued me because I have had a long term interest in numerical analysis and numerical optimisation problems which lend themselves very well to parallel and distributed computing. I decided I should write a Tuple Space Server myself, in Ocaml. Tim's Tuple Space server used threads and Software Transactional Memory (STM) to handle the connection of multiple masters and workers to the server itself. Although the Ocaml CoThreads library does have an STM module I thought there was probably an easier way. In my day job I'm working on some C++ code that handles multiple network sockets and open file descriptors using the POSIX select system call. On Linux at least, there is a select tutorial man page which gives a example of using select written in C.
The beauty of select is that it allows a single process to multiplex multiple sockets and/or file descriptors without resorting to threads. However, the C example in the tutorial clearly demonstrates that this system call is a bit of a pain to use directly. Fortunately, for the project at work, I had some really great C++ base classes written by my colleague Peter to build on top of. These base classes hide all the nastiness of dealing with the system call itself by wrapping the select call into a daemon class and providing a simple base class which clients of the select call can inherit from. It takes three lists of file descriptors (one descriptor list for each of read, write and exceptions), a float value for a timeout and returns a tuple of three lists; one each for the file descriptors ready for reading, writing and exception handling. fd : This is the file descriptor or socket that this task is operating on. wake_time : This is an optional, per task timeout value. It is specified as either None for no timeout or Some with a value in seconds (ie Some 10.0 specifies a ten second timeout). A typical use might be when writing an network daemon where you want to close/drop any client connections which have been silent for more than a specified amount of time. select_on : If this is true, the daemon will add this task's file descriptor to the list of files waiting for read. This field (set to false) in conjunction with the process_wake can be used to implement deferred actions on a descriptor that ignore readiness for read. process_read : This is the function that is called when the file descriptor has data ready to be read. The function takes the task_t struct as a parameter and returns a tuple containing a bool and a task_t list, which may be empty. There's more on what happens with the return values of this function below. process_wake : This is the function that is called when a wake_time value has been set and there has be no activity on the socket for the specified amount of time. This function's return type is the same as for process_read. finalize : This function will be called when either of the above two functions notifies the daemon that the file descriptor should be closed. The first thing to note in the above is the careful use of an immutable field for the file descriptor and mutable fields for process_read, process_wake and wake_time. The file descriptor is immutable so that any client code does not change its value behind the back of the daemon. A bool which indicates whether the daemon should hold onto the task (if true) or if false, the daemon should run the task's finalize function and then drop it to be cleaned up by the garbage collector. A task_t list (possibly empty) of new tasks for the daemon to manage. Typically the daemon's server socket would be managed by the daemon function just like any other socket. When the server socket's process_read function accepts a new client connection it would return the new client task in this list. Find the file descriptors of all the tasks in the hash table which their select_on field set to true (uses Hashtbl.fold). Find the minimum wake_time timeout of all the tasks (this is actually done on the same pass over all items in the hash tables as step 1.). When select returns a list or file descriptors ready to be read, map the file descriptor to a task using the hash table and then run the process_read function of each readable task. For each task whose wake_time is exceeded, run its process_wake function. For steps 4. and 5., if a task's process function returns false as the first element of the tuple it returns, remove the task from the hash table and run the task's finalize function. Also if the second element in the tuple is a non-empty list, then add the tasks to the hash table. tcp.ml A module of TCP/IP helper functions. All lines sent to the server will be immediately echoed back to you. Although I've been using Ocaml for a several years now, I've not yet been in a situation where I've needed to write an Ocaml class to define a C++/Java/Python/Smalltalk/OO style object. I've found that most of the problems I encountered could be easily solved using functional code and that Ocaml's objects didn't provide an obviously better solution. Until now (or so I thought). |     -> failwith "Directory stack is empty." Being placed in the global scope. Being made into a Singleton objecct. Being passed around as a parameter to whatever function may need it. Yuck! Yuck! Double yuck! Suddenly, this object oriented solution didn't look like such a great idea. So while I'm pleased with this solution, it does mean that I'll have to continue my hunt for a problem where an object provides a better solution than any other feature of the Ocaml language. This is particularly ironic because when choosing between two strict statically typed languages, Haskell and Ocaml, I chose Ocaml because I thought I needed objects. However, I stuck with Ocaml because of its pragmatism. Ocaml : Exception Back Traces in Native Code. Some time ago I wrote a blog post about exception back traces which at the time of that post only existed for the Ocaml byte code compiler. However, version 3.10 of the Ocaml compiler which was released about a year ago, included exception back traces for native code as well as byte code. With the imminent release of Ubuntu's Hardy Heron, version 3.10 of the compiler is about to become much more widely available . Enabling exception back traces is as simple as adding the "-g" option to the ocamlopt command line and then setting a single environment variable as follows. I read quite a lot of programming related blogs, but its rare for me to find one as muddle headed as this one titled "Quality Begs for Object-Orientation" on the O'Reilly network. "I think that most functional programming languages are fundamentally broken with respect to the software lifecycle." Now I'm not too sure why he brings up software lifecycle, because all he talks about is testing. However, he does give an example in Java involving testing and wraps up his post by saying that his Java solution is difficult to do in Ocaml, Haskell and Erlang. Feathers gets two things wrong. Firstly he seems to be writing Java code using Ocaml's syntax and then complains that Ocaml is not enough like Java. His conclusion is hardly surprising. Ocaml is simply not designed for writing Java-like object oriented code. The second problem is his claim that testing in functional languages is more difficult than with Java. While this may be true when writing Java code with Ocaml's syntax, it is not true for the more general case of writing idiomatic Ocaml or functional code. So lets look at the testing of Object Oriented code in comparison to Functional code. With the object orientated approach, a bunch of data fields are bundled up together in an object and methods defined some of which may mutate the state of the object's data fields. When testing objects with mutable fields, its important to test that the state transitions are correct under mutation. By way of contrast, when doing functional programming, one attempts to write pure functions; functions which have no internal state and where outputs depend only on inputs and constants. The really nice thing about pure functions is that they are so easy to test. The absence of internal state means that there are no state transitions to test. The only testing left is to collect a bunch of inputs that test for all the boundary conditions, pass each through the function under test and validate the output. Since testing pure functions is easier that testing objects with mutable state, I would suggest that assuring quality using automated testing is easier for functional code than for object oriented code. This conclusion directly contradicts the title of Feathers' blog post: "Quality Begs for Object-Orientation". The lesson to be learned here is that if anyone with a purely Java background wants to learn Ocaml or any other functional language, they have to be prepared for a rather large paradigm shift. Old habits and ways of thinking need to be discarded. For Ocaml, that means ignoring Ocaml's object oriented and imperative programming features for as long as possible and attempting to write nothing but pure stateless functions. Conrad Parker posted this to to reddit and the ensuing discussion was quite interesting. One of the really nice things about using Ocaml on Debian and Ubuntu is the large number of really well packaged third party libraries. Most of these libraries are also well documented from doc strings extracted from the source code files using ocamldoc. However, the documentation for most ocaml libraries is purely reference documentation and its not always obvious how to use the library simply from reading the reference docs. What's really needed is example code to be read in conjunction with the reference docs. In order to get a feel for using it and take my first steps into the world of SQL (which I'd had very minimal exposure to before now), I wrote a small program to test out the features provided by the library. The following stand alone program should be taken as an example of how to access a Sqlite database from Ocaml. Since I am not an SQL expert, the actual SQL usage should be taken with a grain of salt. let stmt = Printf.sprintf "INSERT INTO people values (NULL, '%s', '%s', %d);"
let stmt = Printf.sprintf "INSERT INTO cars values (NULL, '%s', '%s');"
"SELECT * FROM people WHERE age < 30;"
|    Sqlite3.Data.BLOB _ -> "blob"
Printf.printf "  %2d  %4d    %-10s %-8s   %s\n%!" "first = 'Helen' AND last = 'Jones';"
if Sqlite3.db_close db then print_endline "All done.\n"
else print_endline "Cannot close database.\n"
Helen Jones has just turned 30, so update table. Should now only be one person under 30. Bugattis are too expensive, so drop that entry. Lazy evaluation is a default feature of the Haskell programming language and an optional feature of Ocaml. Most programming languages (Ocaml, C, C++, Perl, Python, Java etc) use eager evaluation; where a result specified by a line of code is calculated as soon as the program gets to that line. Lazy evaluation on the other hand, defers the calculation of a result until that result is needed. The real beauty of lazy evaluation is that a result that is never used is never evaluated. Lazy evaluation also allows the specification of lists which are effectively infinite, as long as the programmer doesn't actually try to access every element in the list. Obviously, attempting to do so would take infinite time and and require infinite memory to actually hold the list . While searching for information on Ocaml's lazy programming features I came across a post at the enchanted mind blog. That post is ok, but the code is just snippets and when put together as it is, doesn't actually work. After a bit of fiddling around, I managed to get it working. However, once I understood it, I didn't think the example was as good as it could be. Firstly, the input to the lazy list is just a standard finite length Ocaml list, but more importantly it doesn't give any idea of how to do a potentially infinite list which is a much more interesting case. That left the field open for a nice blog post demonstrating lazy lists in Ocaml. Read on. Anybody who has done high school or higher mathematics would probably have come across recurrence relations the most well know of which is the Fibonacci sequence. If one wanted to generate a list containing say the first 20 Fibonacci numbers using the above recursive function, the 19th number in the sequence would be calculated twice, the 18th number three times so on. Its simply not efficient. The above two lines define a recursive type called lazy_fib_t, which has a single variant called Node which contains a tuple of an integer and the head of a lazy list. The function above, create_fib_list, creates a lazy list. It also contains an internal function, fib_n, which we'll look at later. The last line of the function is where all the magic is; it creates three nodes of a lazy list, the first two containing the first two integers of the Fibonacci sequence and a third node which is a closure, containing a call to the internal function fib_n with the correct parameters to generate the next number in the sequence. The internal function fib_n takes two parameters, the values of the sequence for n - 1 and n - 2. From these two values, it generates the value for n, prints a message and then constructs a new Node containing the value for n and a lazy evaluation for the next value. The print_fib_list function contains an internal function sub_print which is called with a current depth of zero and the head of the lazy list to be printed. The internal function recursively moves down the list until current is greater than depth, which cause the recursion to complete and unwind. 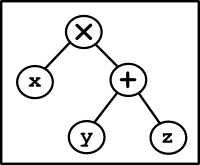 At each node of the lazy list where current is less than or equal to depth, the function forces the evaluation of the node. The forcing will only evaluate a node if it hasn't already been evaluated. Once the node has been force evaluated, the value is printed and the function is called recursively. All it does is call the function create_fib_list, and then print the first four Fibonacci numbers of the list, prints a dashed line and then prints the first six Fibonacci numbers of the list. Its important to note that the print function is called with the same list on both occasions. As can be seen above, the first time the print function is called, the fib_n closure is called for all values of n greater than one. Each time fib_n is called a new node is generated in the list. When the print function is called the second time, it fib_n is only called for values that weren't evaluated on the first call to the print function just as was expected. One of the few problems with the above implementation is that it uses integers which in Ocaml on 32 bit CPU platforms is only a 31 bit integer. It would however be relatively easy to use Ocaml's Big_int module which provides arbitrary length integers. I'm working on a digital filter design program in Ocaml which was suffering from some numerical issues with Ocaml's native 64 bit floats. The problem was that the algorithm operates on both large floating point numbers and small floating point numbers. These numbers eventually end up in a matrix, and I then use Gaussian elimination to solve a set of simultaneous equations. Anyone who has done any numerical computation will know that adding large floating point numbers to small floating numbers is a recipe for numerical inaccuracy. For me, the numerical issues were screwing things up badly. Do all the computations symbolically, and only substitute numbers at the very last stage and then being careful to process the numerical parts in a way to minimize rounding and truncation error. Replace the floating point operations with operations on a number type which can provide higher (and maybe even arbitrary) precision. The first option, doing all the computations symbolically was not practical due to the complexity of the computation. That left only the second option. Looking around for what was available for Ocaml, I found the contfrac project on Sourceforge. As all the math geeks (hi Mark) have probably guessed by now, contfrac expresses numbers in terms of a really cool mathematical concept called continued fractions. All rational numbers have a finite length continued fraction expansion. For example, the rational number 75/99 is expressed as [ 0 ; 1, 3, 8 ]. Not surprisingly, all the irrational numbers have infinite length continued fraction expansions. The surprising thing (for me at least) is that many of the irrational numbers have CF expansions that are surprisingly regular. The square root of two is expressed as [ 1 ; 2, 2, 2, ...] with an infinitely repeating list of 2s. The natural logarithm e is expressed as [ 2 ; 1, 2, 1, 1, 4, 1, 1, 6, ...] which again has a regular pattern, as does the golden ratio, [ 1 ; 1, 1, 1, ...]. While all the previous CF expansions have a degree of regularity, the expansion of pi, is [ 3 ; 7, 15, 1, 292, 1, 1, 1, 2, 1, 3, 1, 14, 2, 1, 1, 2, 2, 2, 2, 1, 84, 2, 1, 1, 15, 3, 13,...], which looks completely random. With numbers expressed as continued fractions, the Ocaml contfrac module then implements addition, subtraction, multiplication and division. Once the four arithmetic operations are defined, contfrac then implements a number of trigonometric and transcendental functions in terms of the same continued fractions. Unfortunately, the module doesn't implement everything I need so I'm going to have to hack on some extra functionality. The actual Ocaml implementation uses Ocaml's lazy lists which is an aspect of Ocaml I hadn't played with yet. Time for some fiddling with lazy lists. There's a paper dated December 2002 by Kevin Murphy where he explains why he was looking at Ocaml. That article was recently linked on programming.reddit.com and there was a comment complaining that Ocaml couldn't print out backtraces on exceptions. Someone posted later that this was not right, but I've heard this complaint often enough that I thought I should blog about how to do it. First off, Ocaml has two compilers, one which produces bytecode and one which produces native binaries. The native code compiler is not currently able to produce exception backtraces and this is where the Reddit commenter got the idea. However, there is a patch in the Ocaml bug tracker which adds backtrace capabilities. I'm hoping that this goes into the compiler proper in the next release or two. Once compiled to bytecode and with the environment variable set, the application can be run and should produce the required backtrace. The following is an example of a backtrace from something I'm working on at the moment (I hacked the code to make sure I could get one). Obviously it would be nicer if function names were included here, but this is more than sufficient for debugging purposes. Ocaml : Code for Variant Types and Pattern Matching. "(" ^ (str_of_expr a) ^ "+" ^ (str_of_expr b) ^ ")"
Obviously, this is just just a demo, but it should be pretty clear that this code could easily be extended to something more useful. Ocaml : Variant Types and Pattern Matching. At last month's SLUG meeting, Mark Greenaway asked if anybody knew of any good Computer Algebra Systems (CAS) available under Linux. I spoke up and told him that I looked around for the same thing some time ago, couldn't find anything that I liked so I ended up writing something that fit my particular needs from scratch. Later that night I was talking to Robert Collins and Andrew Cowie about stretch languages; languages that differ radically from the languages a programmer already knows so that learning the new language teaches them new programming concepts and paradigms. For me, my last stretch language was Ocaml which I started using around mid 2004. I discovered Ocaml when I went looking for a language to implement my Computer Algebra System (CAS) in. I did do a trial implementation in C, but that was simply too much of a pain in the neck. I also knew that C++ was not a sufficiently big step away from C to be useful for this project. My other main language at the time was Python, but I knew Python's dynamic typing would make my life difficult. It was at about this time that I asked my friend Andr� Pang to suggest a language. Andr� had recently given a talk at SLUG titled "Beyond C, C++, Python and Perl" and seemed to know about a whole bunch of different languages. I told him that I was looking for something that was strongly typed, statically typed, had garbage collection for memory management and had Object Oriented (OO) features. One of Andr�'s suggestions was Java which I was already familiar with. However, I disliked the fact that Java does not allow one to write code outside of a class and Java was also a little too verbose for my tastes. He also tried to push Haskell, but Haskell doesn't have traditional OO features. In retrospect this wouldn't have been a problem, but at the time I rejected Haskell for this reason. However, his final suggestion was Ocaml which seemed to fit all of my requirements. While investigating Ocaml I found a small example on the Ocaml Tutorial that implemented a bare bones CAS. The two things that makes Ocaml really great for CAS are variant types and pattern matching on these variants. I'll look at these separately. A variable name which is just a string. A plus node with a left sub expression and a right sub expression. A times node with a left sub expression and a right sub expression. A divide node with a numerator sub expression and a denominator sub expression. with the variable expr being the Times node at the top of the diagram. The really nice thing about variants is that each instance knows which variant it is. That means that its not possible (by mistake or on purpose) to access a node of one variant as another variant. The Ocaml compiler simply won't let that happen. Compare this to a C version using unions where the programmer has be make sure he/she accesses each instance correctly, or the acres of code required to do the same thing with objects in C++ or Java. So once we can construct a mathematical expression we would also want to print it out. Thats where Ocaml's pattern matching comes in. Here's a function to convert any expression tree into a string representation that can be printed. The function is called str_of_expr and the "rec" just before the function name means that the function is recursive. The function takes a single parameter of type expr_t and returns a string. The "match expr with" on the next line is a bit like a switch statement in C, C++, Java and other languages. On the lines following the match there are four options, one for each of the variants of the expr_t type. So for instance, if the expr is a Var variant the function just returns the string that is held by Var and if its a Plus node with two sub expressions, a and b, then the function is called on each of the sub expressions and a string is built using Ocaml's string concatenation operator "^". The above usage of pattern matching is pretty simple and can done almost as easily in other languages. So lets look at something a little more complicated. The function simplify has two transformations and a default case which does nothing. Again, the function is recursive, but the first two match cases match on much more complex expression trees. In fact, the first match case will exactly match our expression and generate the expression we're after, "(x * y + x * z)". Obviously, to make a real Computer Algebra System requires quite a bit more than what I have here. However, as you can see, Ocaml's variant types and pattern matching are a perfect fit for the problems a programmer writing a CAS would face. In fact, few other languages, with the possible exception of Haskell, would have fit this problem as well. The value sum is a reference to an integer which is initialized to zero and the referenced sum is then updated inside the for loop. Operating on references is a little different to operating on values; it requires the use of the de-reference operator "!" to access the referenced value and requires the use of the de-reference assignment operator ":=" to update the referenced value. bit thats only a small win. Obviously, the first parameter passed to fold_left is an anonymous function which takes two parameters x and y and returns their sum and the last parameter is simply the array the fold is being applied. The second parameter, 0 in this case, is where all the magic happens. The value 0 is the value that will be passed to the anonymous function as the x parameter, the first time it is called. For subsequent calls, the value of the x parameter will be the return value of the previous call of the anonymous function. With fold_left the function is applied from first entry to last entry while with fold_right the function is applied in reverse order. With fold_left the initializer/previous result is passed as the first parameter to the applied function while with fold_right the initializer/previous result is passed as the second parameter. Like iter and map, Ocaml's fold functions can reduce the number of points of possible error in a program. More importantly, for the code reader who understands and is comfortable with these techniques, reading and understanding code using these functions is quicker than reading and understanding the equvalient for loop. Ocaml : Iter and Map. Ocaml, like most other languages has arrays for storing multiple values of the same type. Ocaml also has built in lists; lists that behave like the singly linked list that people write in lower level languages like C but without the pain. The astute reader will notice that the for loop approach used above has a couple of things that the programmer must get right. Even in this really simple example, the programmer has to know that array indices start at zero, has to know or find out the length of the array, has to subtract one from that length to avoid accessing elements beyond the last element and then has to explicitly access each element of the array. Fortunately, in functional languages like Ocaml, it is possible to avoid all of these potential causes of error by using more functional idioms like Higher Order Functions (HOF). The idea behind using HOF on lists and arrays is that the programmer defines a function that operates on a single element and then applies that function to each entry one at a time. Here's a simple example program which defines a list of integers and then prints it. Array.iter is a higher order function named iter in the Array module. It takes two paramaters, a function and an array and applies the function to each element of the array. In this particular case, the function printline_int will be applied to each element in int_array from the first to the last. The bit enclosed within the parentheses here defines an anonymous function which takes a single parameter x and then defines the body of the function on the right hand side of the arrow. In this example, the bit within the parentheses is a partially applied function; a function which needs one or more extra parameters to complete the call. In this case the bit within the parentheses behaves just like the printline_int function in the earlier example. All of the Array.iter examples above apply a function to the elements of the array and that function has no return value. In Ocaml, a function without a return value is said to return unit (much like void in C, C++, and Java etc). There are equivalent functions to the ones above which work on lists, called unsurprisingly List.iter and List.map. There are also other interesting functions like iteri (arrays only), filter (lists only), fold_left and fold_right (both arrays and lists) and a couple of others. They are all powerful tools which allow algorithms to be implemented in Ocaml more succinctly and with less chance of error than with imperative programming languages. Our friend Mark Greenaway has been playing around with Ocaml. He's written a program that draws n-sided polygons (for odd n) and then draws lines between the midpoint of each line segment and the opposite vertex to show that all of those lines will coincide at a point which is the middle of the polygon. Mark's solution to this problem is pretty typical of a programmer who comes to Ocaml from imperative languages. Typically it uses a bunch of for loops when better, more functional techniques exist . There's a few algorithmic tweaks here and there but the big difference is the complete lack of for loops. GUI programming is one of those areas thats always a bit of a pain regardless of language used. Ocaml however has some language features (not present in C, C++ Java, Python etc) which make GUI programming in Ocaml somewhat more elegant. When the program's user clicks the mouse button in the widget, this function will be called with a pointer to the widget as the first parameter and a pointer to the button event data (cursor x/y position, time etc) as the second parameter. The third parameter is a generic pointer. At the time the callback is registered, the programmer can set this pointer to be a pointer to anything he/she wishes and then cast it to the right type in the callback. One common usage is to set this as a pointer to a struct containing the current state of the application, so that this state can be modified within the callback function. One common problem I have always run up against when doing the above is when I have more than one instance of a particular widget type and want to handle all of them using a single callback. If the last parameter is a pointer to the state, then how do I differentiate between the different widgets that generate the event. Yes, it can be done using the widget pointer, but thats just a pain. Usually, the best solution is to make the state data a global variable (yuck) and then make the last parameter a value which identifies which widget generated the event. Ocaml has a really neat solution to the above problem; a programming trick called closures. In this particular context, closures allow something that behaves like a partial application of a function. As you can see, this uses our function from above, but calls it with only one parameter. So what the hell is add_to_x? Well its a closure (a type of function) that takes a single integer parameter and adds it to the value the variable x contained when the closure was created. People with a background in OO languages can look at a closure like add_to_x as an object with a single method, but without all the overhead of defining a class and instantiating an object of that class. and when we register the callback with create a closure of the callback function with all but the last parameter. This is a much neater way of doing things than any widget callback handling I've ever seen in C, C++, C#, Java or Python. I'm currently working on an application that, when its (nearly ) ready, will be released under the GNU GPL. This app will require a lot of list and text manipulation so I really wanted to write this in Ocaml where list handling is so nice and text handling is so hard to screw up. I also need a GUI for this app and since I had already done a couple of GUIs in C/GTK+ that may have been an option. Unfortunately, manipulating lists and strings in C is just way too painful to contemplate. I therefore decided to go with Ocaml. The Ocaml bindings to GTK+ is called lablgtk2 and there is also an Ocaml version of the GTK+ 2 tutorial which includes Ocaml versions of all the example programs for the original C/GTK+ tutorial. I always find doing GUIs rather painful and just because I'm writing a GUI in Ocaml doesn't make it any less painful. The GUI basics are always pretty easy; the pain arises when you want to do anything a little unusual and the transition is not at all smooth. One minute you're rocking along thinking, damn, this is easy, and then you hit a brick wall trying to get one tiny little detail working. These problems are even worse in Ocaml because the documentation is nowhere near as good as it could be. In fact, getting the GUI I wanted was proving so difficult that I decided the best way forward might be to write a custom GTK+ widget in C and then wrap that in Ocaml. The first step along this path is to write the widget and a test application in C. This was surprising easy after my battles with Ocaml and lablgtk. The GTK+ developer documentation is pretty good and sticking any GTK+ function name into Google will usually turn up a number of mailing list posts or whatever with example code. I now had a damn good start on a widget in C that I needed to wrap in Ocaml. Or so I thought. It turned out that wrapping the widget and getting data back and forth across the Ocaml/C boundary was going to make this a very difficult exercise. However, I learnt a lot while hacking together the widget in C, so I went back to Ocaml and lablgtk2 and came across a really good method for learning how to do things. First figure out how to do it in C (reading docs / Google / whatever). Grep for same concepts in the lablgtk2 include files (much like C header files) to find out what they are called. Google for "concept lablgtk2" which usually turns up a code snippet that works. With the above information discovery system the Ocaml version of the GUI is getting pretty close to being as full featured as the C version. I'm also finding that lablgtk2 is really nice to work with. Its not just a plain wrapper around the GTK+ functionality. In many places it deviates significantly from the way the GTK+/C interface does things, but where it does, that is a good thing. Once the GUI is done, I need to hook it up to the back end code which is already at least partially working and then I'll be ready for the first pre-alpha release. After hacking in Ocaml for over a year now, I really look forward to releasing my first Ocaml app to the public.